FastReact is a continuous gradient separation rotor and nanoparticle/biofluid reactor in one combined unit. It utilizes some of the major principles found in clinical aphaeresis units (i.e. density-based rather than sedimentation-based separations), but performs multiple separations sequentially in the same physical units, and adds a unique reactor unit in the device that accelerates the interactions between capturing submicron particles and target substances in biofluids. The reactor does this by manipulating the fluid flow characteristics of the biofluid/submicron particle mixture to dramatically increase the frequency of collisions between the two in a short residence time period. This increased encounter frequency increases the likelihood of target capture thousands-fold, allowing thorough sequestration of the target material to occur in a very short time. This innovative design permits the unit to be hooked to a live person without excessive time for the blood to be outside the human body, allowing therapeutic possibilities. It also increases the product output without increasing processing time for in vitro product capture. No aphaeresis system on the market today has this capability. Nanoshell has been awarded two critical patents for this technology, and is free to operate in this space. A number more are pending. The diagrams below give a general picture of how our technology will work. In addition to what is shown the whole unit will be implemented as a portable unit that may be battery or solar powered for short term use. It will include a computer algorithm to control operational parameters that self-adjusts to different biofluids, efficiencies of capture, and progress of the collection. For in vitro use it is envisioned that large quantities of specimen can traverse a closed loop for multiple opportunities at collection, which for in vitro medical use a single pass with dynamically adjusted optimal capturing must be achieved. Innovation: The described technology FastReact is a transformational technology that eliminates many layers of biofluid processing steps, and allows multiple substances to be captured simultaneously from the same specimen with minimal advanced preparation. It is Faster, Simpler, Lower Cost, Safer, Lab Independent, Repeatable, High Throughput, Automatic, Versatile, and Portable. There is no other technology that offers the same benefits and effectiveness on the market today. 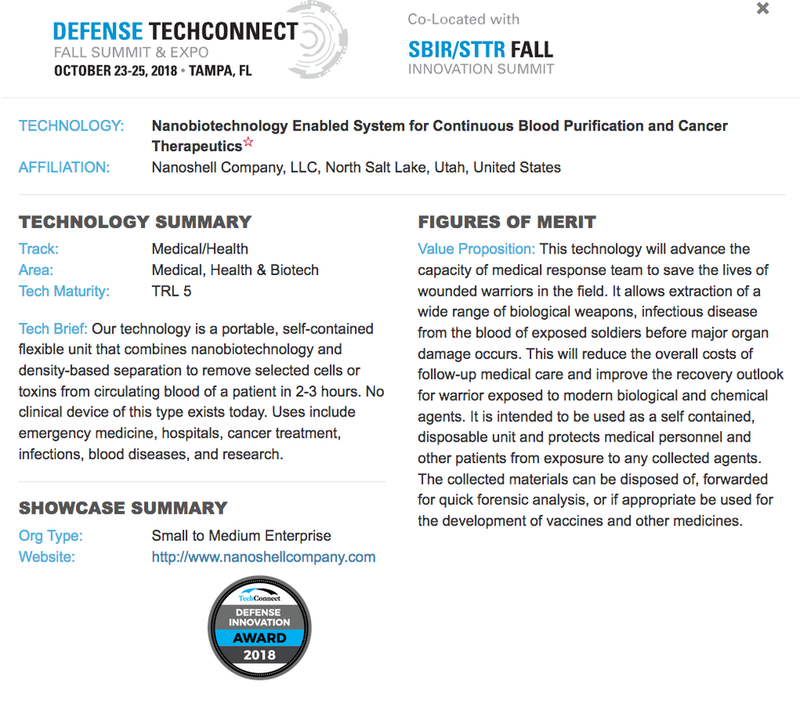 Nanobiotechnology Enabled System for Continuous Blood Purification and Cancer Therapeutics is recognized as a 2018 TechConnect Defense Innovation Awardee at this year's DefenseTechConnect Summit and Expo in Tampa, Florida. Nanoshell Company received a Technology Acceleration Program grant from the State of Utah USTAR program to continue the commercialization path for our innovative Nanopheresis(TM) Blood purification System which combines nano biotechnology, Fastreact (TM) mixing, and 3-D printed fluidics system into a powerful, mobile package that has many applications in health and manufacturing.